Anda Paterson RSW RGI GSWA (born 1935) is one of the best known and most prolific Scottish artists working today. Her work is represented in many public collections, including Aberdeen, Dundee, Inverness and Glasgow Art Galleries. She is known for her depictions of ordinary people going about their daily lives and also caught up in conflicts, war and humanitarian crises. When at art school in 1957, she was one of the founders of the Glasgow Group of Artists, whose aim was to provide more exhibition opportunities for young artists. 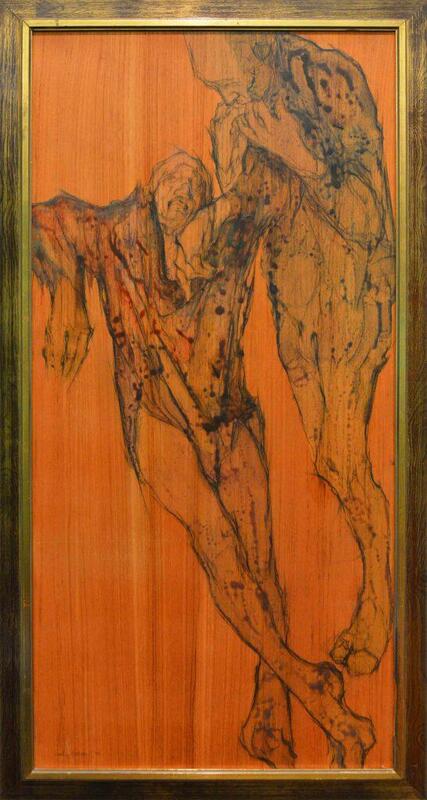 This work, ‘The Pity of War’, is painted on panel and dates to 1970. It is a recent gift to the Stirling Smith by the Scottish Campaign for Nuclear Disarmament whose aim is to educate people on the dangers of nuclear war. The Smith has a small but significant collection on the subject of peace and this is now part of it. Stirling’s Peace Pole, established in 1988, is sited in the grounds of the Smith and is part of an international network of peace poles proclaiming ‘Peace on Earth’ in several languages. Stirling CND members meet here every armistice Sunday and if you would like to observe their ceremony, it takes place this coming Sunday at 2pm.